The Omega Synchrobeat is shrouded in myth and mystery, and is one of the most controversial of all Omega post-war productions. Prices for Synchrobeats have ranged from the astronomical 35,000 CHF to the more reasonable 5100 USD, but what is the intrinsic value of these pieces? What are the real fundamentals of the collectability of this series and can claims of rarity be sustained? Your Syncrobeat article was interesting and informative. You claim to have "stumbled" across many examples over the years. This clearly contradicts Norman Morris's recollection. No doubt you recorded the serial numbers. . . It would be most informative for Omega enthusiats, if you listed the serial numbers and it would substantiate your claim. Yes Erik, I have taken the serial numbers of those watch I have seen over the past four years. I dont think the owners would mind me mentioning them. The only one I dont have is the serial belonging to a watchmaker in Califormia who works for an Omega service agent. 704, 329, 205 (no case), 178, 159, 459, 718, and yours 284, plus the Californian example, plus another example belonging to a Puristpro member, who, on reading this, may like to share the number. Your serial number list is most is most appreciated. Seven watches, one movement. . . I can offer two more numbers for the list. Both are only movements. 064 and 495. Even with that, it's still not enough to refute Morris's claim of 17. Your thoughts on the recall issue are intersting and logical. Obviously at some point, Omeaga realized it was better to stop production than continue repairs or replacements. It's surprising Omega's records are so vague or lacking in information all together. Perhaps it's their intent to keep the Syncrobeat mystery alive and well. With that in mind, the section where you discuss values. . .Whether it was by intent or not, you managed to do a "hatchet job" on these watches in that area. Syncrobeats fall into a category much the same as a fine vintage automobile where rarity and uniqueness have priorities. Originality adds to that equation and to the value. I would think most owners likey feel that way. Thanks for the additional serials. Much appreciated. While that adds the tally, in my mind, to twelve in four years (I’ve seen pics of the examples mentioned where serials weren’t mentioned but I need those owners to volunteer the serials). While that doesn’t make seventeen or more, I don’t see that as the most significant or relevant point to the discussion about pieces in circulation. What I see as extremely significant is the number of watches that have surfaced over a short period. I would argue that it is statistically impossible for so many examples to surface in a model that allegedly has 17 pieces in circulation. When compared with other models that have known limited numbers such as the 168.023 Seamaster golden, a white dialled Railmaster with a special chronometer execution of the caliber 283, some military versions of 1950 handwinds etc, the numbers surfacing over time are few, and often only one or two. But with a watch that is said to have only 17 pieces in circulation it is absolutely unheard of that so many would suddenly pop up post 2007. I honestly don’t know what Omega’s intentions are in respect to this model. I think natural Swiss ‘hauteur’ would encourage them to want to ignore it, as Omega did until 2007, when, all of a sudden, the ‘seventeen pieces’ story was given an airing during Omegamania. Certainly, in the early 2000s the Museum was not talking about 17 pieces, and I imagine that the report from the NMC sales manager came after that, which is fifty rather than forty years after the event. I’ll review the essay in the light of your comment about the “hatchet job” and will modify it if I think it’s too strong. However, it is clear from the aspect of the design and engineering of this piece that it was indeed a failure – one of Omega’s few. The question of whether working models of this ‘failure’ perhaps deserve a little more respect is the one that your comment has raised in my mind. It's interesting to note that twelve watches (at least three are only movements) have surfaced thus far and no more. It seems odd more have not been accounted for. . .If more actually do exist. Going back to the 2007 auction sale at 42,000chf. . . Many people question the validity of that sale because of Omega's involvement. To my knowledge, nobody to date has come forth to deny that claimed amount. Normally, news of that sort would cause enough of a stir, that dozens of these watches would have surfaced. . .If in fact, they existed. Another part of the mystery to be solved. The recent eBay sale at $5100usd would likely indicate the lower end of the value range. This example had a poorly restored dial, a rather tired looking movement and the provenance was not known. That being said, the relationship of these watches to that of vintage automobiles goes further. Restoration has it's merits with out question. . .if done properly. However, originality is a quality most often lost by the restoration process. This is also something to be considered with timepieces. Rarity, originality and provenance are all highly respected qualities sought after with vintage autos. Collectors pay premium prices for prime examples. These same qualities should apply to vintage timepieces and place the values considerably higher. The Syncrobeat as Omega's "failure"is also a bit like a series of coins that have been mis-struck during minting. These coins are usually unique, rare, and would certainly be considered failures. They too most often command a premium price. The Syncrobeat is a rare and unique watch within the Omega lineup of vintage timepieces. Yes , they are a mystery however, these watches deserve far more respect and the values should reflect that. I think Eric, that, in the case of movements only having been unearthed, the likely explanation is that their cases were scrapped for gold. I suspect that may have happened more than we think as wear began to compromise the jump second complication long after these watches were sold. Agree that rarity, originality and provenance are important to a degree in watch collecting. Auction houses often apply a three-level scale to vintage machinery – uncommon, scare or rare – but in each case one must have very good evidence of supply, and in the case of the 372 I don’t believe that the supply issue has been addressed to any degree of satisfaction. The fact that 12 pieces have surfaced in four years can be compared with, say, the Golden Seamaster, which had a confirmed run of 1000 pieces. Around ten Golden Seamasters have surfaced over the same period. Agree with your points on originality. It is important in watch collecting and in your instance the dial is original. But originality alone doesn’t make a watch collectible as it’s a confluence of originality, horological importance, numbers, demand, etc that informs the collectability and value of watches. Provenance, again, can be important (for example an Omega proved to have belonged to Buddy Holly, or John Lennon, or indeed John Kennedy). In your case I think it adds value because you can prove a family connection with the watch since new. What I think informs the value of your watch is that you have a working model that appears in good condition. To me this is the conundrum. Arguably, it is not a watch that should be worn a lot, if any more than an occasional wind to demonstrate the complication. This is because of its design fault and the inevitability of the watch going the way of many of its contemporaries and experiencing wear in the pinion, third wheel teeth and whip (I would venture there is some wear there now). From a collecting perspective, one should have a parts movement in very good condition as a back-up if one was to acquire a Synchrobeat, so that parts would be available should the watch fail. The above will impact on the demand side of the collectability equation, in my opinion. It’s for those and other reasons mentioned that I cant see the value of a Synchrobeat in a fully informed market being much more than 5k.......BUT as I’ve said before, the value of a watch is ultimately decided by what someone will pay for it. Thank you for including your serial number as it adds to the number of known examples. You don't indicate what is actually wrong with the watch so I'm not sure if you are referring to the dead second 'complication' (as they call it) or some other non-functioning part of the movement. So, if the problem is that of parts that don't contribute to the dead second assembly, you have at least one albeit patience-demanding option. The actual movement on your watch is part of the calibre 360 family - calibres 360, 361,370 and 371 (best option), which means that the parts from these other calibres are interchangeable with your calibre 372 movement. Around 100,000 pieces of this series were produced, so while it may seem like looking for a needle in a haystack sooner or later you will find an example for sale. It will take a lot of trawling through the internet and on the likes of eBay over time, but diligence should produce its own rewards. The other option is to ask the collector mentioned on this post who has two movements but no cases if he would consent to sell one. In some ways you are at a disadvantage in such a situation as the collector could conceivably say no in order to bring pressure on you to sell your piece to him. On the other hand he may be quite happy to part with one....at a price. The price could be steep, but, again, I am simply speculating. If you wish to pursue the second option, click on the 'about me' link on the RH column and you'll find an email option. You've forgotten one important example - the golden flightmaster with gold bracelet. Only 20 examples have been made and we have already seen at least 6 different models come up for sale since omegamania; 7 if you count the omegamania one. And those are just the ones I've noticed - I am sure there others that have slipped my notice since this is out of my price range and I haven't really been keeping close tabs on it. If you restrict the sales to antiquorum, the ratio is 3 golden flightmasters with the gold bracelet to 1 synchrobeat. I agree the myth of 17 is not written in stone but until omega changes it's stand, that continues to be their official story - in print. I would say it is much more uncommon than the golden seamaster and also more uncommon than a screwback manual wind Rg (which is a pretty rare watch in itself). I believe that 200 pieces of the deluxe 345.801 Flightmaster were produced and I agree with your speculations on numbers having surfaced since 2007. I get a few bulletins from the various auction houses, and around half a dozen would be about right. Don't know if we're talking apples here as the FM is a highly visible collectors grail that continues to excite higher end collectors, so I would expect a bit of churn, whereas the Synchro is 20 years its senior and probably less in the sights of people generally. I figure about a dozen or more of the Synchrobeats have surfaced since Omegamania (or at least have had their owners identified) I'm collecting serial numbers and pressing two owners to cough them up. Sadly, Mike, the new crowd at the Omega Museum aren't as interested as the old guard in having a dialogue with collectors about rarity and numbers, and so I think the myth of 17 will be the subject of controversy until the numbers start stacking up over 17. At 18 the myth is busted. A number of entries in 'Journey' have been proven to be erroneous, but that is normal in a tome of such substance, and I think time will prove the Synchrobeat entry to be wrong as well. Our only resort in these instances is to speculate and bring some reasoned argument to bear on issues of rarity, and I would agree with you in respect to being less common than the Golden Seamaster and possibly the luxury finish 30T2 RG screwback. Thanks for the reply. The Golden Flightmaster though had 200 overall but only 20 with the gold bracelet and the numbers I quoted are the ones only with the gold bracelet so it is a closer comparison to the synchrobeat. This "20" number is quoted not only by John Goldberger but is written in the omega issued certificate for the piece (I suppose they kept better records by the early 1970s). You can find such a certification in the for sale ad for the piece reficul_x posted on TZ - I believe the pictures are still up. So I would say 6 of 19 have been put on the market for the past 4 years or so - I say 19 since piece #1 was a gift to the late King of Jordan and will likely never be sold. I don't know I would say this was more of a grail than the synchrobeat - I would probably say they have different audiences as they are totally different pieces. I would add though it is much harder to find an all original synchrobeat in running good condition than a golden flightmaster with the gold bracelet - partly because the synchrobeat is much older and partly because it had a more fragile movement. Perhaps the more pertinent question to ask if we are to consider value is how many of the synchrobeats you have documentation of are running, have a totally original dial and is housed in a case that has either been only lightly polished or never been polished. I would say the number would then dwindle to 1 or 2. Anyway, these are my thoughts on the matter and wanted to add them to this discussion. I am hugely skeptical about twenty Gold Flightmasters only in existence with gold bracelets and the fact that so many have surfaced, again, suggests to me that many more than twenty were ultimately accessorised with bracelets: 20 from the factory and more at point of sale. As far as I know these bracelets fit any pilot line gold case because the lug width is the same. The "twenty" assertion first started as the "forty" assertion when Eric So speculated years ago that fewer people would opt for the bracelet at point of sale than opt for leather. The 20 was confirmed on an extract from Omega Museum, but that only related to numbers of BA 145.013's leaving the factory with gold bracelets. This was a customary practice. For example some Golden Seamasters left the factory with bracelets, but many more (comparatively speaking) were accessorised at point of sale with a choice of three different gold bracelets. I think the most interesting question is, how many left the factory with the stamp 345.801 on the double clasp. I have seen examples with different clasps, where in one instance the Omega symbol is at the end of a shorter clasp and others instances where the symbol has not overlapped on a longer clasp. So I argue that more bracelets were optionally fitted on purchase. I would also argue that on occasions FMs with bracelet may have been separated, when a client chose to opt for leather and the bracelet could then have been used on other gold pilot line cases. I concede that more of the 200 would have been on leather, but I also argue that people have misconstrued the fact that twenty full ensembles left the factory to mean that there are only twenty braceleted FMs out there. So, when we take that into consideration, I dont believe we can be all that assured in a Flightmaster versus Synchrobeat comparison. Strangely, Mike, most of the Synchrobeats I have come across are working, but, of course, in varying degrees of condition. Of course, I accept your point about mint versus banged up having a big impact on value, but I still believe horological importance is a deciding factor in a fully informed market. Thanks again for the reply. Was wondering if you could answer my final query, how many of the 10-12 serial numbers you have are running, properly cased and have original (never refinished/repainted) dial and hands? My personal count is 2 - wondering if you have different numbers. Thanks. I didn't count the one in Journey and the one sold at omegamania since they look to me to be redials. I also searched the archives of Heritage to 2006 and no synchrobeat sold there - I noted 85 omegas during that time including buddy holly's watch but no synchrobeat (I remember you mentioned one was sold there). You may be right about there being more than 17 but I would guesstimate less than 10 all original examples in running condition exist and not a one of those was ever sold in antiquorum - I would guess this latest one which didn't sell on ebay is the only all original example I've seen for sale in the past 5 years or so making it overall one of the hardest vintage omegas to find. You've certainly prompted me to keep a closer eye out for these watches. Yes Mike, I counted Omegamania redial but not 'Journey' watch at all because I don't have the serial number for that one. I speculate there would be many more in original state(that is original dial, case and movement - condition is another matter) however only time will tell if they are unearthed. I don't equate hard to find with value necessarily. 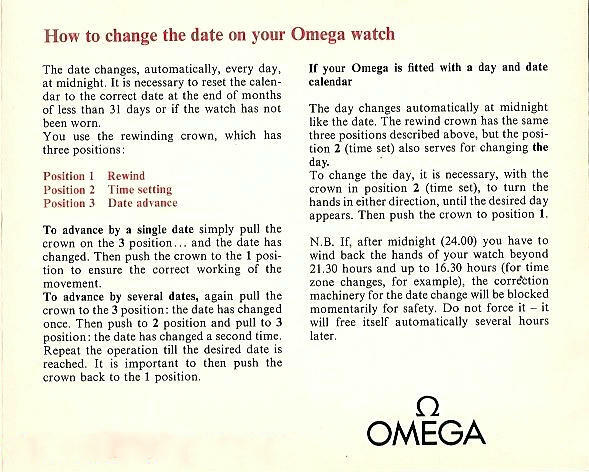 I think when all is said and done it will be demand that determines value of these and other uncommon vintage Omegas and, the issue that I have laboured with all along is whether in an informed market there is demand for one of the few horological failures in the history of the Omega company. OK add one more, 583. What I have is a partial running uncased movement. Missing at the very least the center seconds pinion but with a functioning sub seconds, odd indeed. More than likely just a bastardized "repair" by someone who had no idea the significance of the piece. Now that I know the base cal was the 360 perhaps I can piece this one back together. PS - You had photos of one of my Globemasters up at one time. Yes I recall the Globemaster....and thanks a million for advising your serial number. I'll add it to the essay. There should be plenty of cal 360s around from which you can purloin parts...so good luck with the project. I have an Omega watch but dont know what kind it is. The closet image i could get that looks similar to it, comes from round the seventies. It is in a gold case and has a gold back. It is an automatic but you cant change the time only the day and date. the shape looks like the back of that Syncrobeat. But i see the sycrobeat only has a date on it not day and date, so this is not a Syncrobeat. All that this watch says on the front it Omega and underneath it says automatic. and right at the bottom, swiss made. Can you help, is there a place i can upload a pic. This watch is not in good condition, not the original strap or backing. Best click on the about me tab on the rh column of the blog and send me some pics.